Along central Panama’s southern coast of Coclé, JW Marriott Panama Golf & Beach Resort provides a fun-loving yet secluded environment ideal for guests seeking both relaxation and adventure in high doses. The stylish beachfront resort, set in the exclusive community of Buenaventura, 80 minutes west of Panama City, centers around a Jack Nicklaus-designed golf course, rivaled by its on-site Corotú Spa. With just five treatment rooms, the spa sets the tone for an intimate, stress-free wellness experience, where guests will delight in sublime holistic treatments and a sleekly tiled hydrotherapy circuit. 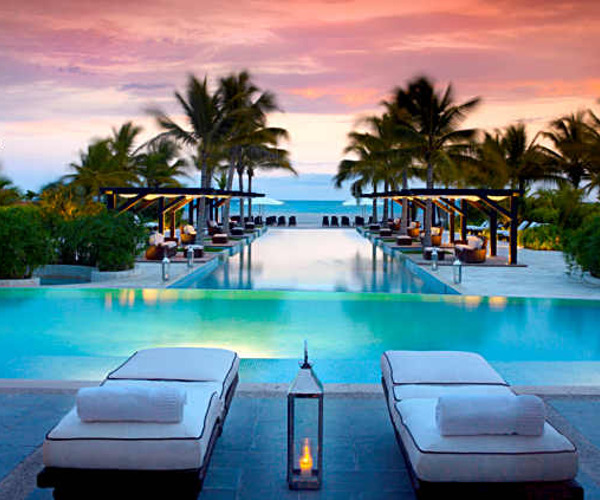 Three swimming pools surrounded by crisp white cabanas and Pacific Ocean vistas complete the resort’s relaxed vibe. Thrill seekers have their own exciting itinerary of enjoyment, with ample eco-jaunts and sporting escapades by land and sea, including ziplining and surfing in Rio Mar. After a day outdoors, guests dine on fresh seasonal fare before sleeping soundly in tastefully appointed guest rooms and suites, cozily surrounded by verdant gardens and the tranquil Buenaventura lagoon. Occupying 378 square meters, Corotú Spa has designed an enchanting haven that celebrates Panama’s beauty. The region’s indigenous elements can be found throughout the spa, from textured design accents and fragrances to shades of color and sounds. Ancient traditions from local cultures inspire the treatment menu, which comprises such indulgences as innovative aloe-honey wraps, aromatherapy and Ayurvedic massage services, organic and oxygen facials, and coffee and bamboo scrubs that balance body, mind, and spirit. Spa-goers can also reserve the Corotú Body Massage, a blissful ritual combining tropical essential oils, or try the Pixbae Wrap, a multi-step treatment that includes a revitalizing banana leaf wrap and customized massage using organic oils. Before or after services, guests can rotate among the whirlpools, deluge showers, a sauna, and steam room that encompass the hydrotherapy circuit. Neighboring the spa is a 90-square-meter fitness center that lures exercise fans with Life Fitness, Technogym, and Precor equipment; in addition, workout opportunities include personal training sessions and yogacise, body sculpting, and aquafit classes. Guests can while away their time hitting the beach, playing tennis or partaking in a lesson on one of two lighted courts, swimming in one of three pools, or teeing off at the on-site Buenaventura Golf Club course. Designed by Jack Nicklaus, the 18-hole, par-72 course takes full advantage of its lush Pacific coastline setting. Horseback riding is less than one mile from JW Marriott, and guests are near landmarks like the town of Valle de Anton, popular for its public market, open daily, and Canopy Tower, a must-visit for prime wildlife and bird watching. Days can also be spent touring the petroglyphs of La Piedra Pintada or browsing the Coronado Shopping Center. Those vacationing with the kids will appreciate activities such as children’s camp, painting classes, and movie nights. Guest rooms and suites, tucked away amidst verdant gardens and a lagoon landscape, emphasize elegant Spanish-Colonial style. 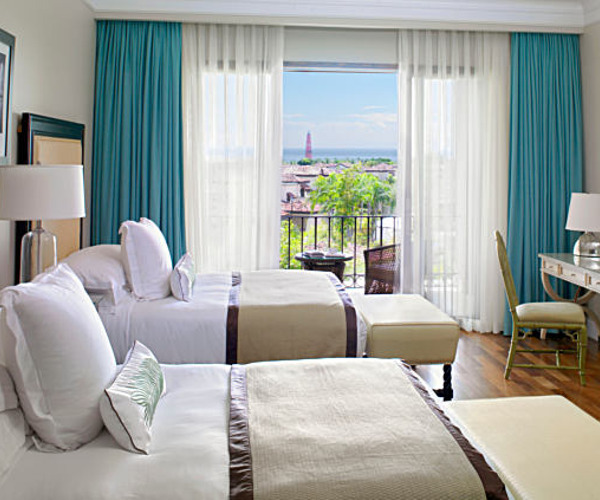 Bathed in soft color palettes, each room has a private garden or balcony and comes furnished with hardwood flooring, a bed bedecked in down duvets and Egyptian-cotton linens, and marble bathroom with soaking tub. Convenient amenities include high-speed Internet access, iPod docking stations, and 42-inch LCD televisions. Diners are in for an authentic culinary treat at Tamarindo restaurant, as a feast of inspiring Panamanian specialties crafted from locally sourced ingredients is paired with sparkling Buenaventura lagoon views. Open for dinner, Tai Kai serves Japanese cuisine, fresh sushi rolls, and handcrafted martinis, while Prime 19, located in the golf clubhouse, features a lineup of fine meats and other hearty dishes. El Faro, which provides both pool and beach service, is a good choice for those simply desiring light bites.